Probably over-thinking it. Its real job is not to please (or not please) me, but to keep a little boy warm and happy. But, this week I realized that the bucket…was nearly EMPTY. Obviously, I have done some cutting as I go along, but still, the stock has fallen short. And I still have a long ways to go. The true queen would have been 95″ square and contain 365 blocks (19×19 layout of 5″ squares). Right now I have 133 star blocks and 141 chain blocks. 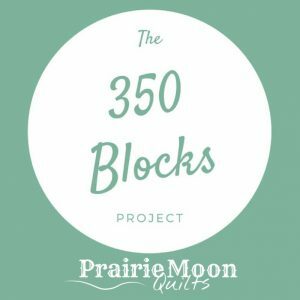 IF I change plans and go for an 85″ square quilt it will be only 289 blocks. I would be REALLY close. So…what do I do? Change plans? Be happy? Press on? This idea was my first plan for the Shine On quilt, but I decided I wanted different sizes of stars. Plus, there wasn’t enough of this color combination to make the size quilt I needed for Shine On. This idea was worth completing, though. It started as a bag of vintage (late 60s? early 70s?) fabric squares that a friend bought at a yard sale. They were not well cut and not all the fabric was usable, but there was a cheeriness to them that appealed. Adding the bright white stars and some solids squares scattered throughout seems to keep the vintage feel and make it modern at the same time. I like it. Final size 60″ x 72″. Started with 4-1/2″ squares and 2-1/2″ stitch-and-trim squares for the points. A quilt for my grandson and upcoming tutorial is now a complete flimsy. You may recognize some of the same black and white fabrics used in my recent house quilt. At 80″ square, it is tough to have enough room inside during the wet, snowy weather. At night. It was years in the planning, and quite a while in the making, but it is finally done. It is based on the Heritage Stars pattern from McCall’s quilting 2012. The color scheme rotates around the back, Husband’s home state favorite college football team. He was stunned. In 20 years I have never made a quilt just for him. I tried to include a few novelty fabrics here and there that have meaning in his life, like fish. Overall, it is a success. And Husband, that patient and long-suffering man, finally has a quilt of his own. This is my worst picture in a long time, but it is what it is and I don’t have the desire to do it again right now. The Heritage Stars quilt is a top. 74″ square. Hopefully will get it quilted in the next week or so. Opinions wanted: black binding? or gold?